So old Bill Niman finally got the boot. 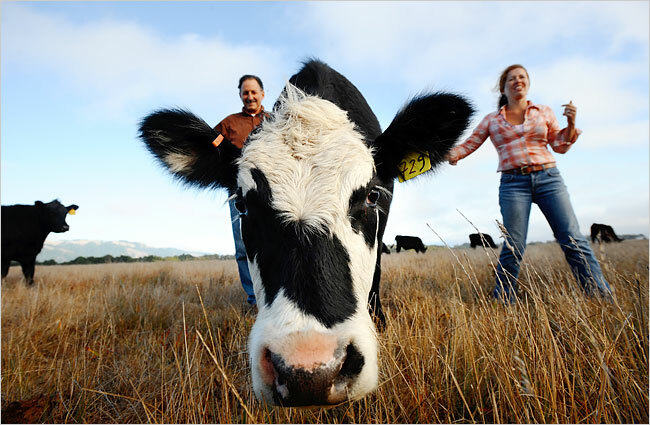 As a former Californian, I was well aware of Niman Ranch's long-standing reputation for high-quality, all-natural beef and pork. Little did I know that Niman himself was forced out last year in a management struggle over a loosening of his rigorous standards of meat production. The NYT has the skinny in today's Dining section. Though a true pioneer, Niman was apparently never much of a businessman and, according to Jeff Swain - the current CEO of Niman Ranch, his beef business never made money. As a result, they had to dispense with some of the marginal central elements of Niman's production technique. Yes, that's right. They had to destroy Niman's principles in order to save them. Oh the irony! What that means for you and me, of course, is that (assuming you haven't already) you should stop buying that Niman Ranch bacon from Trader Joe's. Alice Waters, ahead of the curve as usual, stopped carrying his products back in 2002 when (with Bill still at the company) they continued to grain finish their beef rather than go 100% pasture fed. But Niman Ranch the corporate product is now the poster child for what happens when big[ger] business collides with small-scale agricultural practices. Turns out that it's hard to scale up small-scale. How surprising. ...Mr. Niman's young goat was compared to pan-seared and roasted loin and shoulder cuts from both a small Vermont grower and what the chef Dan Barber called "commodity goat." The commodity goat was slightly musty and chewy. The Vermont goat was as tender and mild as lamb. The Niman goat was like lamb, too, but a lamb with a big personality. The meat was sweet and vegetal. The fat, what little of it there was, tasted rich but felt lighter than olive oil. No gym socks aftertaste here! Plus, goat has half the fat content of chicken, so says the Department of Agriculture. Count me in! oooh that description of the goat meat is heavenly! When are we getting that at WW? Yeah, I think there's a goat meat purveyor at the local farmers market. Maybe I can convince my lovely wife to give it a try. Just tried the goat curry at our local jamaican place... it'd be great to find a "sweet and vegetal" niman version of it to experiment in the kitchen with. Yumm. I came across this article and just had to comment - the fact was that the Niman Ranch program before he sold it was a much looser standard - certain antibiotics were allowed and the meat was NOT graded. Now the standards are actually more rigorous - no antibiotics of any kind, grading of the beef occurs, and feedback is shared with ranchers. Because of these steps the meat has tighter standards, farmers are getting better feedback and they're able to support more farmers than ever.